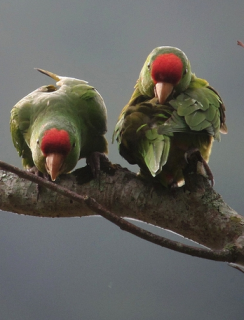 The Red-fronted Conure has been heavily traded: since 1981, 76,974 wild-caught birds have been reported in international trade (2005). P.w. wagleri: Both adults mainly green, with yellowish underparts; red forehead to forecrown; occasional red band or scattered red feathers on throat; green bend of wing and carpal edge; olive/yellow greater underwing coverts and undersides of flight feathers. Bill horn in colour. Eye ring bare and white. Eye dull yellow with grey inner ring. P.w. transilis: Both adults as in wagleri but in general darker green in colour; red on crown darker and less extensive. P.w. frontatus: Both adults red forecrown; red around lores and eyes; red thighs and bend of wing to carpal edge. Larger in size. P.w. minor: Both adults as in frontata, but smaller in size; overall colour darker without bronze/yellow tinge of frontata; red on thighs paler and more extensive; upper mandible notch rounded. P.w. wagleri: Red on forecrown duller and less extensive or missing. Bill pink/grey at base of upper mandible. Eye ring bare and grey/white. Eye grey. Calls made in flight are repetitious and high-pitched, discordant notes; higher in pitch than that of Mitred Conure A. mitrata. Aviary or suspended enclosure, minimum length 3m (10 ft). Fruits such as: apple, pear, kiwi, papaya, mango, cactus fruits, banana, orange, forming about 30 percent of diet; vegetables such as: carrots, celery, green beans and peas in the pod; green leaves such as: Swiss chard, lettuce, sowthistle, dandelion, kale, chickweed; fresh corn; small seed mix such as: canary, millet and smaller amounts of oats, buckwheat, safflower and a little hemp; small amount of sunflower seed, soaked or sprouted; cooked beans and pulses and boiled maize and complete kibble. Provide bird-safe, unsprayed branches of fir, willow, pine or saskatoon bush; vegetable tanned leather or wooden block chew toys; push and pull toys; foraging/puzzle toys; swings, ladders and ropes. Provide overhead misters or shallow water bowls for bathing. This species has experienced some decline due to habitat loss and heavy trapping for the wild bird trade. P. wagleri: NW Venezuela, from Sierra de Perija, Zulia and both slopes of Andes in Merida east to mountains of Yaracuy and Distrito Federal, and W Colombia, from Santa Marta Mountains and Sierra de Perija south along Andean cordilleras; also reported on eastern slope of Cordillera Oriental, to Narino. P. transilis: Coastal mountains of Sucre and N Monagas, NE Venezuela. P. frontatus: Pacific slope of Andes in S Ecuador and W Peru, south to Tacna. P. minor: C Andes of Peru from Rio Maranon valley, Amazonas and possibly Zumba district in nearby S Ecuador, south to Ayacucho and Apurimac. Found from 350-2800m (1148-9184 ft) in moist and humid forest including cloud forest and secondary growth mainly in upper tropical and lower subtropical zones, with occasional forays into the subtemperate zone. In Peru this species has been reported from semi-arid cloud forest. May also be found in humid plantations, cornfields and cactus scrub. Diet includes a variety of fruits, nuts and seeds; may take grain or fruit crops. Seen in social groups of up to 20; occasionally 300 or more. Feeds in the canopy and roosts at dusk in communal roosting areas in cliffs, which are also required for nesting. December-June, N Colombia; April-June, Venezuela.